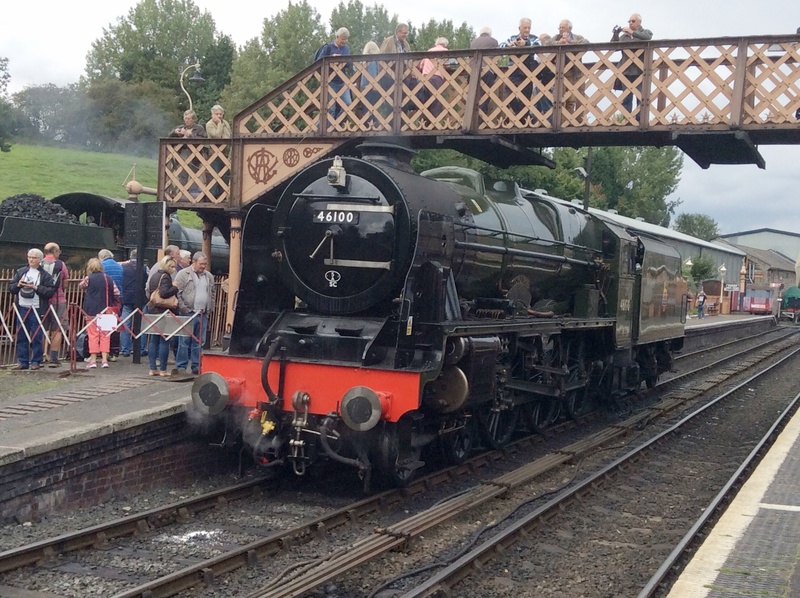 The second visitor to the Severn Valley Railway Autumn Steam Gala, is LMS Princess Coronation Class 4-6-2 “Pacific” No.46233 ‘Duchess of Sutherland’ . This was built in 1938 by Crewe Works for the London Midland and Scottish Railway. Built as a high speed express passenger locomotive, 46233 was built to haul fast express passenger services such as ‘The Royal Scot’ and ‘The Mid-Day Scot’ between London Euston and Glasgow Central as well as other expresses to Liverpool. 6233 was outshopped in July 1938 from Crewe Works and was part of the third batch of her class. These were unstreamlined, painted in LMS standard crimson lake livery and had a single chimney and no smoke deflectors and an estimated cost of £13,800 each. 6233 was initially allocated to Camden, London. It acquired a double chimney in March 1941 and because of drifting smoke acquired smoke deflectors in September 1945 before being painted in postwar LMS black livery in September 1946. With the creation of British Railways on 1 January 1948 it was allocated to Crewe North depot. BR renumbered the locomotive to 46233 in October 1948 and repainted it in BR Brunswick green livery in 1952 or early 1953. In June 1958 it was allocated to Carlisle Upperby before eventually being withdrawn from Edge Hill depot in February 1964. During its 25 years service Duchess of Sutherland ran 1,650,000 miles – the second highest mileage by any member of the class. It was Withdrawn by British Railways in 1964, the locomotive was originally sold to Butlins holiday camp in Scotland. In 1996, the locomotive was acquired by The Princess Royal Class Locomotive Trust with the intention of restoration to mainline condition . By 2001, 46233 had been restored to operating condition and since then has been a regular performer on the national network. On 6 March 2010, 6233 was rolled out in LMS lined black livery, which was retained during 2010, before a major overhaul, taking 6233 out of service for the 2011 season. On 3 March 2012, now renumbered 46233 it was rolled out in “authentic (Brunswick) green” livery, as used by British Railways during the early 1950s, at the Midland Railway – Butterley following a major overhaul. Since then it has been again be repainted in LMS Crimson Lake and renumbered LMS 6233. 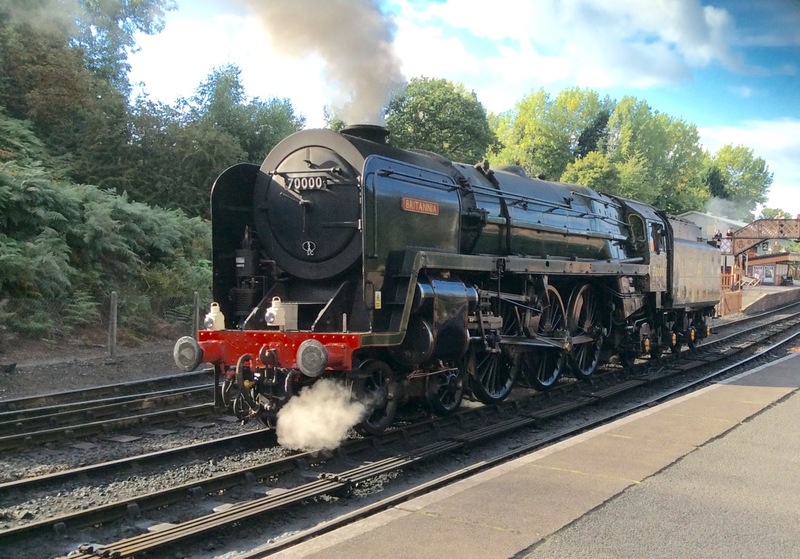 The third visiting locomotive for the Severn Valley Railway Autumn Steam Gala is British Rail Standard class 7 4-6-2 Pacific No. 70000 Britannia. Britannia was built at Crewe, completed on 2 January 1951. She was the first British Railways standard locomotive to be built and the first of 55 locomotives of the Britannia class. The locomotive was named at a ceremony at Marylebone Station by the then Minister for Transport Alfred Barnes on 30 January 1951. The BR Locomotive Naming Committee were determined not to use names already in use on other locomotives. They tried to observe this by not selecting the name Britannia for use on 70000 because it was already in use on one of the ex-LMS Jubilee Class locomotives, however Robert Riddles overruled them and the Jubilee had to be renamed. Britannia was initially based at Stratford (30A) in order to work East Anglian expresses to Norwich and Great Yarmouth, but was also particularly associated with the Hook Continental boat train to Harwich. Subsequently, the loco was based at Norwich Thorpe (w/e 31 January 1959) and March (June 1961) before spending the remainder of her career on the London Midland Region: Willesden (1A) (w/e 30 March 1963), Crewe North (5A) (w/e 25 May 1963), Crewe South (5B) (w/e 19 May 1965) and finally Newton Heath (9D) (w/e 5 March 1966) from where she was withdrawn w/e 28 May 1966. The locomotive pulled the funeral train of King George VI from King’s Lynn, Norfolk to London following his death in February 1952 at Sandringham House, Norfolk and Britannia had her cab roof painted white, as was the custom with royal locomotives. Britannia has also worn the white roof in preservation. Britannia was withdrawn in May 1966, after 15 years of service. Initially destined for the National Railway Museum because of her cultural significance, she was stored. However, due to her prototype design and construction differences, the NRM chose standard sister 70013 Oliver Cromwell, instead. Britannia was eventually bought by Britannia Locomotive Company Ltd. She was eventually returned to steam on the Severn Valley Railway, where she remained between 1971 and 1980, in operational but non-mainline condition. With the society wishing to make more use of the locomotive, she was moved to the European gauge Nene Valley Railway in Peterborough, where she was also fitted with an air-brake compressor, and was based there from 1980-2000. Britannia made her return to the main line on 27 July 1991, successfully working enthusiast trips until 1997, and was featured in an episode of London’s Burning. Due to the high cost of refurbishment, the locomotive was sold to Pete Waterman in 2000 with an expired mainline boiler certificate. She was Stored at Waterman’s workshops at the Crewe Heritage Centre, However the amount of work resulted in Waterman selling her to Jeremy Hosking. The locomotive underwent restoration at Crewe which involved a newly refurbished cab, a new smoke box and major work on the boiler; replacement steel sides, new crown stays, new front section barrel section, new steel and copper tubeplate, repairs and patches to door plate and major work to copper firebox. In 2011 Britannia was Transferred to the Royal Scot Locomotive and General Trust (RSL&GT), and returned to main line operational condition in its prototype black British Railways livery (where it did not have nameplates fitted, as was thus known by railway convention as 70000). After a running-in period, in 2012 the locomotive was repainted in British Railways Brunswick Green, but with an early BR crest (unlike her sister 70013 Oliver Cromwell which carries BR’s Late Crest). On 24 January 2012, the loco hauled the Royal Train with Prince Charles on board to Wakefield Kirkgate, where he rededicated the locomotive. For the trip the loco again had a painted white cab roof, removed after the engine’s appearance at the West Somerset Railway’s Spring Gala. After extensive work to the locomotive over three years, the team of engineers at LNWR(H) completed the rebuilding of the locomotive and successfully returned her to steam at their Crewe Diesel Depot. The final vistor for the 2018 Severn Valley Railway autumn Steam Gala is Ex LNER Q6 Class/NER T2 0-8-0 heavy freight locomotive no. 3395, Ex BR 63395. It was originally theThe North Eastern Railway Class T2, but was reclassified as Class Q6 by the LNER. It is one of One-hundred-and-twenty which were originally built at Darlington Works and Armstrong Whitworth between 1913 and 1921 to the design of Vincent Raven, based on the NER Class T and T1 (LNER Q5). LNER Q6 3395 was built in 1918 And is normally on the North York Moors Railway.